Since 1966, Asteroid Precision has been serving the precision grinding industry in Illinois and the greater Midwest with elite centerless grinding services. We have become a recognized and respected name in the precision grinding space due to our use of cutting-edge technology and consistently excellent results for our clients. Although we can do work for any industry, we have established ourselves as specialists in aerospace, defense, medical equipment, hydraulics, and automotive parts by building relationships with our clients in these areas and producing reliable results that are up to their exacting standards. If you need quality centerless grinding services for your components, choose Asteroid Precision in Illinois. Centerless grinding is an important process for producing some of the most specific components across the industries we specialize in. From control rods and camshafts to hydraulics and fluid controls, centerless grinding produces the roundness and accuracy needed for any of the cylindrical parts. Unlike traditional cylindrical grinding where a workpiece is held by a chuck or other fitting, centerless grinding positions the workpiece without a workholding method between regulating wheel and a grinding wheel. The component is positioned on an angled support. The regulating wheel’s speed and angle can be adjusted to provide for a feed grind or a stationary precision grind depending on what the specifications of the job requirements. Centerless grinding is a fantastic approach to getting a well ground surface on long, thin components and the lack of a holding device typically allows for a faster throughput. Additionally, the diametrical wheel adjustment on a centerless grinder produces a higher level of precision than the radial wheel adjustments of a traditional cylindrical grinder. When you are looking for a precision grinding company to handle your OEM component production, we know that Asteroid Precision in Illinois isn’t your only available choice. However, we are confident that very few precision grinders can provide the results that we can through our experience and world-class machinery. It’s these aspects of Asteroid Precision that have led to our impressive record of success. We care about the quality of work that is done for your business and we know that we can do it better than anyone else. With over 50 years of experience producing consistent and reliable components for our clients, we have the experience that you need to feel confident in the return on your investment with us. We never settle into our ways, and we are always improving the quality of our work through training for our team and the acquisition of the latest centerless grinding technology. This dedication to ongoing excellence and achievement is what has earned us our reputation as a global leader in precision grinding. 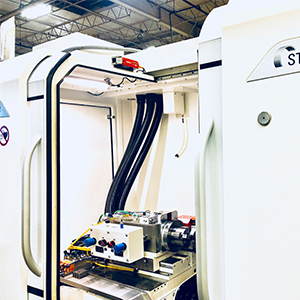 In addition to relying on cutting-edge technology like the machines above, we also make use the highest quality machine components, grinding wheels, lubricants, and coolants on the market to produce the best results from each and every grind. Each run of OEM parts that comes through our precision grinding shop in Illinois passes through a series of rigorous inspections. Our four-stage inspection process begins with a thorough inspection of the lot’s first article and ends with a complete quality control review of the entire lot. We continually monitor and measure the results of our precision grinding process to make sure components are meeting the exact specifications required. If you have questions for our team about our centerless grinding services or are interested in discussing getting your job started, then contact Asteroid Precision today and speak with a member of our team.